A lot of people ask me what the difference is between Minecraft and Terraria. Although they are two different games there are differences. Here is what I see as the main differences between the two games. 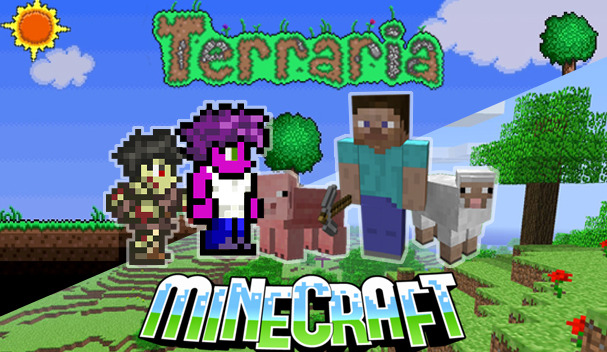 Minecraft is a 3d game but Terraria are 2d. In Terraria you can create your own person but Minecraft you can’t. In Terraria you can chose different size of the map but Minecraft you can’t. In Minecraft you get no items at the start but in Terraria you get Pick axe, Sword, Axe. In Terraria there are more structures than Minecraft. In Minecraft there is 5 armors and in Terraria 15 different armors. In Minecraft if you don’t want to fight enemies at night you can go in to your house and sleep in your sweet bed, but In Terraria you going to have to fight all night or just stay in house. In Minecraft there are 14 enemies that will attack you but in Terraria there are over 50 enemies. Also Minecraft got 9 Passive mobs but Terraria only got 9. In Minecraft there is only 1 boss, but Terraria there is 8 different bosses. Minecraft has only 1 types of NPC‘s but Terraria got 12 types of NPC’s. Minecraft has 8 different types of ores, but Terraria got 11 ores.